Hachigata Castle (鉢形城, hachigatajo) is the ruin of the hilltop castle in Yorii, Saitama. 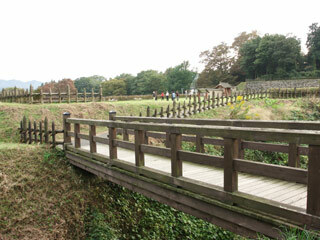 The hill, moat and wall is still preserved well so that you can imagine the original shape of this castle. This castle is one of the excellent castle because the during the Hideyoshi’s Kanto War, it keep over there months surrounded by 35,000 warriors of Kagekatsu Uesugi and Toshiie Maeda with only 3,000 people of protectors. When you see this castle from inside and outside, you will see why this castle was hard to attack. There is parking, closed at 5 pm. Hachigata Castle was built in approximately 1476 by Nagao Kageharu of the Late Hōjō clan. The castle was constructed at an excellent location, as it oversaw much traffic at an important crossroads, and was situated between two rivers. Hōjō Ujikuni improved the defences of the castle after he became lord in 1560. Takeda Shingen attempted to seize the castle in 1568 during the Siege of Hachigata (1568), but failed due to its extensive fortifications. For a month in 1590, Hachigata Castle held off the forces of both Maeda Toshiie and Uesugi Kagekatsu with a mere 3,000 defenders during the Siege of Hachigata (1590). Ujikuni finally surrendered the castle under the condition that the lives of his men would be spared. During the Edo period, the castle was demolished.